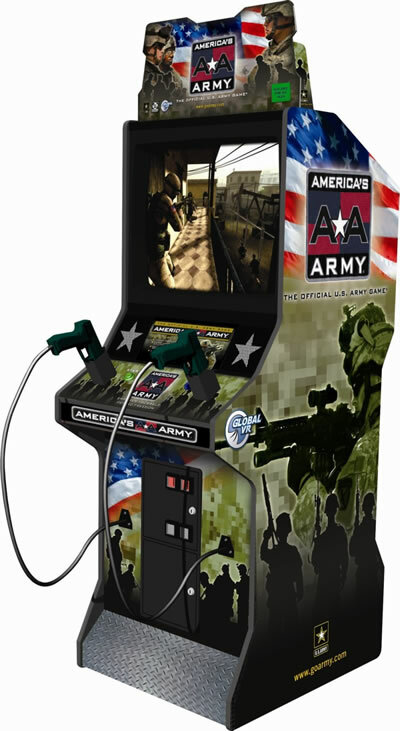 The America's Army arcade game is an official implementation of the US Army's software by GlobalVR. Looks like the US Army has directly implemented the Last Starfighter strategy. The arcade game version will include ht training mini-games that intend to bring highly authentic Army training exercises to players, along with a drill sergeant to ‘bring out the best in each player’. Working hand-in-hand with U.S. Army Subject Matter Experts and with the full cooperation of units of the U.S. Army, the coin-operated AMERICA’S ARMY is a realistic and engaging game centered on exciting training exercises, and includes a significant amount of authentic Army videos and other information designed to immerse the player in the Army culture. In the excellent 1984 sci-fi movie The Last Starfighter, a video game is used to train and identify potential star pilots - for real. Read more at Arcade Heroes via The Raw Feed.